Approximately 800 students from area high schools will get multiple perspectives on the importance of the U.S. government on its 231st birthday through a Constitution Day performance and presentations on Sept. 17, 2018, at The University of Texas at El Paso. 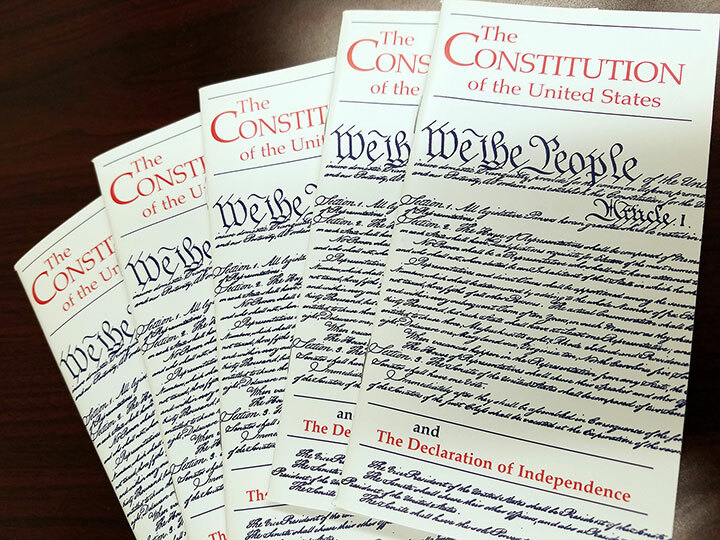 Organizers of the 2018 Constitution Day celebration at UTEP hope the high school participants will learn about the Constitution and its importance to U.S. democracy. UTEP faculty members from the departments of English, Theatre Arts and Political Science, and the Women’s Studies, Chicano Studies and African-American Studies programs will lead seven sessions that focus on the U.S. Constitution, several of its amendments and constitutional law. The activities are from 9:45 a.m. to 1:30 p.m. in Union Building East, the Fox Fine Arts Center and the Blumberg Auditorium inside the University Library. The event will start at 9:30 a.m. with a brief welcome by Denis O’Hearn, Ph.D., dean of the College of Liberal Arts, at Centennial Plaza before the students go to the first of the three sessions they will attend. Topics will include citizenship, antislavery literature and the women’s suffrage movement. UTEP’s Center for Civic Engagement also will conduct a voter registration drive in the Union as part of the program. While the University always celebrates Constitution Day, 2018 is the first year that organizers have arranged anything this big on campus. While the program’s emphasis is on the Constitution, a secondary focus is to familiarize these students with UTEP, some of its academic programs and their instructors, said Irasema Coronado, Ph.D., professor of political science and one of UTEP’s Constitution Day organizers. “Hopefully (the high school seniors) will appreciate the importance of higher education, learn about the Constitution, and leave UTEP armed with information on how this document enhances our democracy,” Coronado said. One of the more visual sessions will be “Exercising Our Rights: A Series of Performance Pieces Highlighting the First Amendment,” which will be produced by James “Jay” Stratton, assistant professor of performance in the Department of Theatre and Dance. Stratton promised that his cast of 10 students will entertain their guests with skits, raps, a song and a dance as they are being informed about the importance of the First Amendment, which provides freedoms of speech, religion and peaceful assembly as well as freedoms of the press and to petition the government. He said “the Constitution Crew” would offer some serious messages, but the majority of the session will be fun. The 14th Amendment, adopted on July 9, 1868, defines citizenship as anyone born or naturalized in the United States, provides equal protection of the laws, and forbids states to restrict basic rights of citizens or other persons. Williams said he would ask the students questions throughout the presentation to bolster their understanding of the history of oppressive segregation. He said he wants students to understand the rights they have through the Constitution and the power and responsibility to demand those rights even when it is challenging to do so. Tiffanie Allberg, social studies department head at Irvin High School, said she was “stoked” about this program because the session topics resonated with her students. She said she expects the program will open many conversations among the 50 Irvin students who will attend. Instructors selected the participants based on their class attendance and interest in civic engagement. Allberg, an educator for 18 years who earned her bachelor’s degree in political science from UTEP in 2000, said many of her students are active in their community and want to make it better, but they do not always feel as if they are part of the process. Allberg added that UTEP’s Department of Political Science has agreed to send several instructors to the Northeast high school, 9465 Roanoke Dr., as part of a lecture series that will start in October 2018.